Can you make a decent living - or even better, make your dream income - teaching yoga? You’ve decided that teaching yoga is your passion. You know that you want to share this practice with others and serve your community with yoga. I meet a lot of teachers who work incredibly hard and put so much energy and love into what they do, BUT more often than not, they struggle to make teaching yoga a financially viable career. It may not be easy, but it’s entirely possible. Teaching yoga doesn't have to mean having side gigs or a full-time job to make a decent income (unless you want to, of course). It doesn't have to mean sacrificing a certain standard of living or giving up on your personal goals and dreams. But if you want to teach yoga full-time, and have the financial freedom to do the things you love, having the right mindset is crucial. And we know this as yogis. Mindset is key. To create a financially sustainable career I believe it is absolutely crucial to embrace your role as a yoga business owner. Unless you have a full-time teaching job with benefits at a studio or an organization of some kind, you are not an employee; you are an independent contractor or sole-proprietor. Legally, that means you are in business for yourself. I believe confidence comes from owning it. Being your own boss and stepping into your role as a business owner can be scary and overwhelming but also fully empowering. It means you can forge your own path and focus on sharing the part of the practice you feel most called to share. 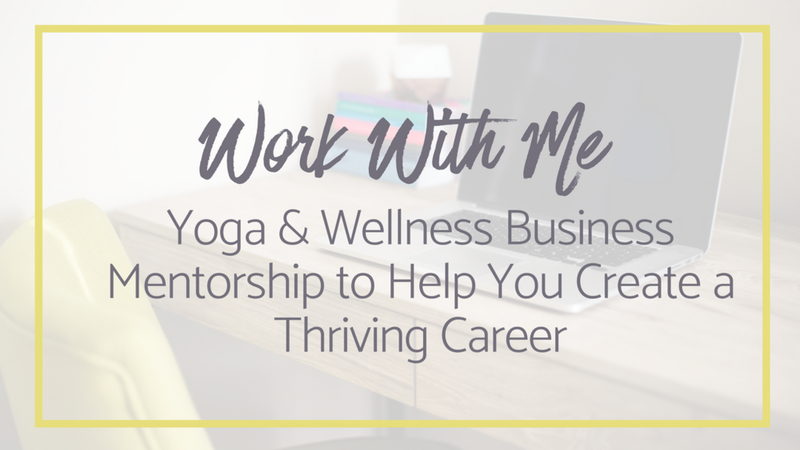 You get to choose the type of yoga career or business you want to build and grow. You get to design a business that is in complete alignment with your values, your beliefs, and how you want to show up for your students. But you have to make sure that your yoga business is financially viable so that you can continue doing this long-term. Because most of us don’t have a trust fund or a financial backer, we need to make sure we can pay our bills and make sure our business is financially viable. It means you take the necessary steps to set up your business with intention, planning, dedication, and commitment. It means you take the time to get clear on what your specific business will look like, what your goals are, and how you are going to make it financially viable. It’s better to take a small step in the right direction with focus and clarity than to run around teaching 20+ classes a week in 6 different studio (aka the yoga teacher hustle). It means to be intentional about creating the foundational structure that you need to have in place, to build a sustainable business that has a long-term vision. Why did I decide to teach yoga? What part of this practice do I love the most and do I want to share with my students? What skills and expertise do I bring to the table as a teacher? How does that make me different or unique? Who do I want to serve? What types of students do I feel called to teach the most? What’s my yoga niche and how can I serve that community? What type of business do I envision? What makes sense for my lifestyle goals? How will my business support my goals and dreams? Just like in any other business, finding the balance of where to spend your time, money and energy is essential. This can seem hard at times. Many yoga teachers focus their time, money and energy in learning how to become better teachers by taking additional teacher trainings and certifications. Becoming a more knowledgeable teacher is key to growing your career and serving your students in the best way possible. On the other hand, you also want to focus on becoming a better business owner. Learning how to create a sustainable business, what offerings to focus on, how to budget and price your offerings, and how the authentically promote your business. This is the vehicle that will allow you to take what you’ve learned (all those amazing trainings and workshops you’ve attended to become a better teacher) and build it into your business in a strategic way. - The yang - your business structure, profit clarity, business goals, marketing, and visibility. You need both the yin and the yang to create a well rounded and sustainable yoga or wellness business. What mindset shifts do you need to create a financially sustainable yoga business that supports you and serves your students better? Need support and guidance in your yoga business? Check out the Yoga Business Mentorship Program, where we help you create the foundation for a thriving and sustainable yoga business. Sign up for the waitlist below to learn more!